Bari is the capital city of the Metropolitan City of Bari and of the Apulia region, on the Adriatic Sea, in southern Italy. It is the second most important economic centre of mainland Southern Italy after Naples and Palermo, a port and university city, as well as the city of Saint Nicholas. The city itself has a population of 326,799, as of 2015, over 116 square kilometres (45 sq mi), while the urban area has 750,000 inhabitants. The metropolitan area has 1.3 million inhabitants. Brancaccio was born on 15 April 1592, the son of Baron Muzio II Brancaccio, governor of Apulia and Zenobia in the Kingdom of Naples. He was educated by the Jesuits in Naples. He was ordained there as a priest in 1619 and was rose through local ecclesiastic ranks until 1627 when he became Bishop of Capaccio which was then within the Kingdom of Naples. On 8 Sep 1627, he was consecrated bishop by Cosimo de Torres, Cardinal-Priest of San Pancrazio, with Giuseppe Acquaviva, Titular Archbishop of Thebae, and Francesco Nappi (bishop), Bishop of Polignano, serving as co-consecrators. While a bishop, he came into conflict with the local foot guards with whom he had a disagreement about local ecclesiastic jurisdiction. When the disagreement was elevated to armed conflict, a castrato in Brancaccio's employ killed the captain of the guard. The Vice-King  ordered the bishop to stand trial and he obeyed; making arrangements to travel to Naples to give his account. But rather than travel to Naples he fled in a felucca towards Rome and upon arrival sought an audience with Pope Urban VIII to explain his side of the story. Urban agreed to defend the bishop and a furious Kingdom of Naples took custody of all the wealth and assets of Brancaccio's bishopric. Apulia is a region in Southern Italy bordering the Adriatic Sea to the east, the Ionian Sea to the southeast, and the Strait of Otranto and Gulf of Taranto to the south. The region comprises 19,345 square kilometers (7,469 sq mi), and its population is about four million. Septimia Zenobia was a third century queen of the Palmyrene Empire in Syria. Many legends surround her ancestry; she was probably not a commoner and she married the ruler of the city, Odaenathus. Her husband became king in 260, elevating Palmyra to supreme power in the Near East by defeating the Sassanians and stabilizing the Roman East. After Odaenathus' assassination, Zenobia became the regent of her son Vaballathus and held de facto power throughout his reign. Pope Urban absolved Brancaccio of any crime and ordered that he be returned to Capaccio but the Vice-King opposed it and urged the pope to send him elsewhere. The Pope, in need of more cardinals loyal to the Barberini cause, instead kept Brancaccio in Rome and he was elevated to the rank of cardinal in his consistory of 28 November 1633. Ippolito Aldobrandini was a Catholic Cardinal. He served as Camerlengo of the Holy Roman Church from 1623 to 1638. Pope Clement VIII, whose birth name was also Ippolito Aldobrandini, was his great-uncle. Salvator Rosa was an Italian Baroque painter, poet, and printmaker, who was active in Naples, Rome, and Florence. As a painter, he is best known as "unorthodox and extravagant" as well as being a "perpetual rebel" and a proto-Romantic. ↑ Note: usually a local count or other noble charged with the administration of the kingdom. Giovanni Battista Maria Pallotta was an Italian Catholic Cardinal. Antonio Marcello Barberini, O.F.M. Cap. was an Italian cardinal and the younger brother of Maffeo Barberini, later Pope Urban VIII. He is sometimes referred to as Antonio the Elder to distinguish him from his nephew Antonio Barberini. Giulio Cesare Sacchetti was an Italian Catholic Cardinal and was twice included in the French Court's list of acceptable candidates for the Papacy, in 1644 and 1655. Marcello Lante della Rovere was an Italian people Catholic Cardinal appointed Dean and Camerlengo of the College of Cardinals. Giambattista Altieri was an Italian Catholic Cardinal. Pier Luigi Carafa (Senior) was a cardinal of the Catholic Church, and a member of the Roman Curia. Marco Antonio Franciotti was an Italian Catholic Cardinal and Bishop of Lucca. Tommaso Carafa was a Roman Catholic prelate who served as Bishop of Capaccio (1639–1664) and Bishop of Vulturara e Montecorvino (1623–1637). 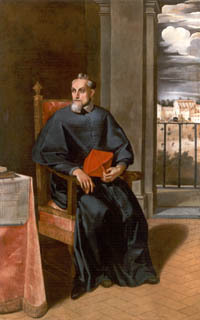 Giovanni Battista De Pace, C.O. was a Roman Catholic prelate who served as Bishop of Capaccio (1684–1698). Giovanni Garzia Mellini was a Roman Catholic prelate who served as Cardinal-Bishop of Frascati (1629), Cardinal-Priest of San Lorenzo in Lucina (1627–1629), Camerlengo of the Sacred College of Cardinals (1623–1625), Archpriest of the Basilica di Santa Maria Maggiore (1622–1629), Cardinal-Priest of Santi Quattro Coronati (1608–1627), Archbishop of Imola (1607–1611), and Apostolic Nuncio to Spain (1605–1607). Alessandro Cesarini, iuniore was a Roman Catholic prelate who served as Cardinal-Deacon of Sant'Eustachio (1638–1644), Cardinal-Deacon of Santa Maria in Cosmedin (1637–1638), Bishop of Viterbo e Tuscania (1636–1638), Cardinal-Deacon of Santi Cosma e Damiano (1632–1637), and Cardinal-Deacon of Santa Maria in Domnica (1627–1632). Archbishop Gaetano Cossa, C.R. was a Roman Catholic prelate who served as Archbishop of Otranto (1635–1657). Giuseppe de Rossi, O.F.M. Conv. (1610–1659) was a Roman Catholic prelate who served as Bishop of Umbriatico (1655–1659). Fabrizio Suardi or Alessandro Suardi was a Roman Catholic prelate who served as Bishop of Caserta (1637–1638) and Bishop of Lucera (1619–1637). Cosimo de Torres also Cosmo de Torres and Cosma de Torres (1584–1642) was a Roman Catholic cardinal who served as Cardinal-Priest of Santa Maria in Trastevere (1641–1642), Cardinal-Priest of San Pancrazio (1623–1641), Archbishop of Monreale (1634–1642), Bishop of Perugia (1624–1634), Apostolic Nuncio to Poland (1621–1622), and Titular Archbishop of Hadrianopolis in Haemimonto (1621–1622). Tiberio Muscettola, C.O. was a Roman Catholic prelate who served as Archbishop of Manfredonia (1680–1708). Carlo Francesco Airoldi (1637–1683) was a Roman Catholic prelate who served as Titular Archbishop of Edessa in Osrhoëne (1673–1683), Apostolic Nuncio to Venice (1675–1683), Apostolic Nuncio to Florence (1673–1675), and Apostolic Internuncio to Belgium (1668–1673). Stefano Brancaccio (1618–1682) was a Roman Catholic cardinal. Antonio Ricciulli (1615–1660) was a Roman Catholic prelate who served as Bishop of Umbriatico (1659–1660).